Plugin version 3.5 introduces a brand new system, that allows you to create and customize custom filters on the front end. These powerful custom filters are related to custom fields. These filters are useful if you for example want to create a Price range slider to filter your WooCommerce products by price or Checkboxes to select whether the product is on stock or not. You should only create one item per custom field. The items you create must have different custom field assigned. 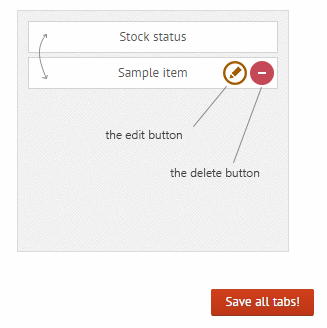 How to create a custom selector? Make sure that the operator corresponds with the custom field values. For numeric values use the numeric operators and for string values use the string operators. There are two ways to load the values of each filter, statically and dynamically. By default, there are static values, which are entered manually, but it is also possible to load all the values of the custom field from the database directly. ..then all the values used with that custom field will be printed as options. 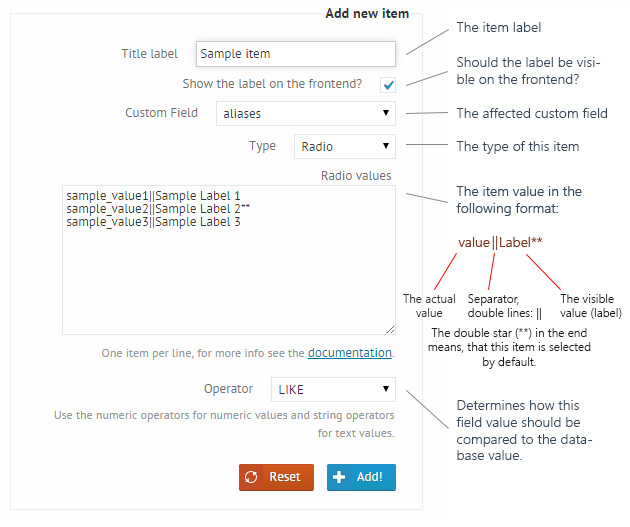 For other types (radio, drop-down etc..) the first value will be selected by default. This will output a 'Choose one' and 'Value 1' options before the list of the database values. By selecting Any Value, the filter will be ignored. One option may represent multiple values. In that case, the plugin will check if either of the values match (or logic), when the option is selected. When choosing Option 1, the plugin will check if either value1, value2 or value3 matches the field. When choosing Option 2, it checks for value4 or value5. More or less the Radio, Checkbox and Dropdown types are similar. However the slider and the Range slider type is a bit different. These types were intended to use with NUMERIC fields only. Moreover the Range slider type uses the BETWEEN operator.